This book is perfect for the new EQ8 user. 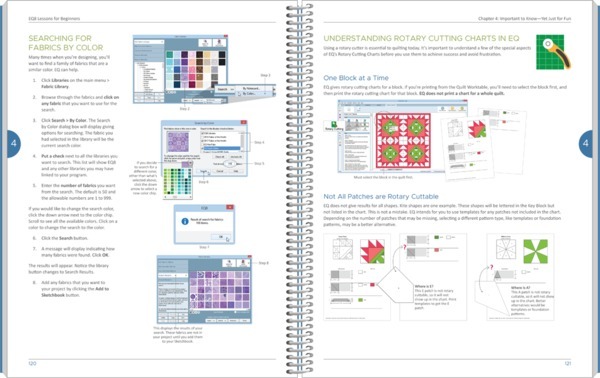 The step-by-step lessons guide the reader through the basic tasks of drawing blocks, importing fabric scans and designing quilts. Lessons are easy to follow and cover all the basics of the software. The lessons are easy to follow and cover the basics of each of the three main worktables of EQ8. You will design quilts, draw blocks, import fabric scans, print patterns and calculate yardage estimates. Even if you’ve owned earlier versions of EQ, this book will introduce new features, while refreshing and energizing your approach to quilt design. This 128-page fully illustrated color book has a convenient spiral binding that allows pages to rotate 360 degrees and lay flat. Print patterns and yardage charts, learn to make quilt labels, design traditional and modern quilts, and have fun along the way! EQ8 has a fresh new look so this book is ideal for owners of previous versions of EQ. The exercises will steer the user through EQ8, demonstrating new features and uncovering old features that were hidden in previous versions of EQ. Use this book to make old features new and hidden features found! 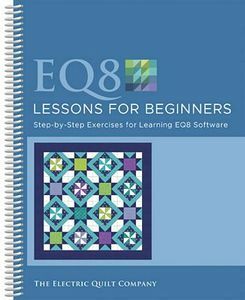 This is a must-have book for any EQ8 user! Size 8.5x11in. Companion item: EQ8 Block Library, EQ8BLOCK. Chapter 1 gives an in-depth look at each worktable. Learn how to name projects and see the contents of your Project Sketchbook. Learn to use the Home screen and how to find help. Electric Quilt 7657A EQ Printables Inkjet Fabric Sheets, 6 of 8.5"x11"